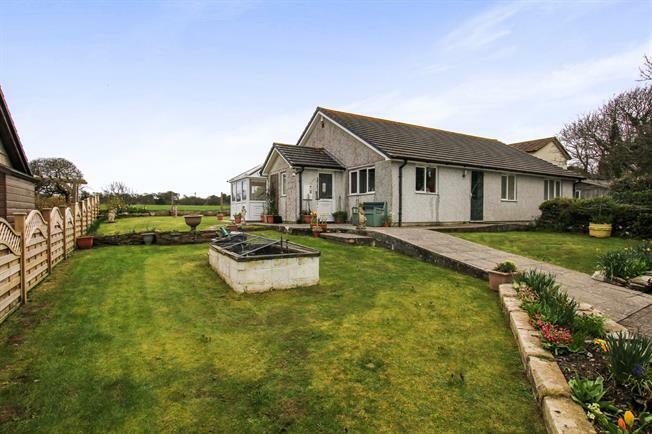 3 Bedroom Detached Bungalow For Sale in Boscastle for Asking Price £400,000. A wonderful spacious bungalow situated on a fabulous plot with fabulous views over the countryside. The property itself offers kitchen breakfast room, spacious lounge, conservatory/sun room, cloakroom, three double bedrooms, en-suite to two bedrooms. Outside, the property offers gardens to the front side and rear. To the front is a driveway with ample parking a double garage with lighting and power. UPVC double glazed door. Double glazed uPVC window facing the front. Radiator. Roll top work surface, fitted, wall and base and breakfast bar units, one and a half bowl sink, electric oven, LPG gas hob, integrated dishwasher. Large storage cupboard and airing cupboard, radiator. Doors to bedrooms bathroom and utility room. Double glazed uPVC window facing the rear uPVC double glazed patio doors to the rear. Feature fire place, radiator. Carpeted flooring Door to sun room. UPVC door and windows opening onto the patio. UPVC door to the front. Pluming and space for washing machine. Double glazed uPVC window facing the side. Radiator. Low level WC, panelled bath, corner shower, pedestal sink. Double glazed uPVC window facing the front. Radiator, carpeted flooring. Door to en-suite. Triple aspect double glazed uPVC windows facing the rear and side. Radiator, carpeted flooring, built-in storage cupboard. Door to en-suite. Low level WC, corner shower, pedestal sink, radiator. This property is situated on a corner spacious plot with a block paved ample driveway providing plenty of off road parking and leading to a separate double garage which has power and lighting. There are gardens to the front, side and rear which also provide countryside views from many aspects of the property.